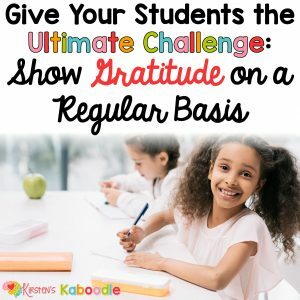 Are you looking for new ways to help your students achieve success, not only academically, but also with their behavior choices? Although I don’t have a magic wand or a miracle cure, I will share quick mindfulness and meditation tips and tricks that you can implement in as little as 10 minutes a day. 10 minutes of peace in your classroom EVERY SINGLE DAY? Yes, the dream is real folks! Current research suggests that mindfulness and meditation practices are beneficial for children. Some of those benefits include increased attention, better self-regulation and self-awareness, and increased resilience. 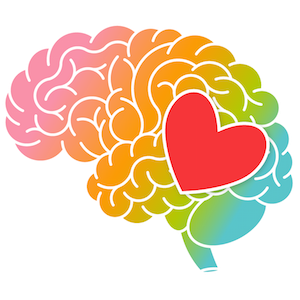 Mindfulness and meditation can also impact the parts of the brain which regulate emotions, memory, and decision-making (the amygdala, hippocampus, and the prefrontal cortex). In addition, research shows that meditation, in place of in-school suspension, is having a positive impact on problematic student behavior. 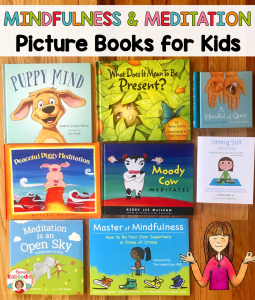 Meditation and mindfulness can be explained in simple, easy-to-understand terms for the youngest learners. In the most general terms, mindfulness is an awareness of the present moment, while meditation is a more formal mindfulness practice. The benefits of mindfulness and meditation increase when teachers provide guidance and practice for students. When done in small chunks, the benefits are cumulative and you won’t have to spend an extended period of time implementing it. Dreamy, right? I thought so too! Choose a ten-minute chunk of time in your day. Many teachers choose a time in the afternoon since kids generally have a more difficult time maintaining focus and body control after they’ve been in school for 3 or 4 hours. I’ve found that the middle of the afternoon works well because it helps prevent students from mentally checking out during the final hour of the day. 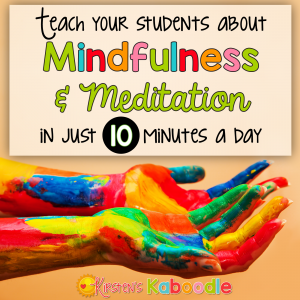 Spend some time giving students an explanation of mindfulness. Students are more willing to take risks and try something new if they have information about why it will serve them. Explain that mindfulness is about awareness, being present, acceptance, and focus. Awareness is about paying attention to your environment, your thoughts, and your body. Being present is about making efforts to let go of the past and any worries about the future. Acceptance is about accepting yourself, your current situation, and the people or things around you. Focus is about choosing what you are paying attention to in the current moment. You might choose to focus on your body, your breath, your thoughts, your experiences, or your senses. Spend some time explaining the benefits of practicing meditation. Tell students that meditation is when a person or a group of people take time to train their brains to be more mindful and aware. 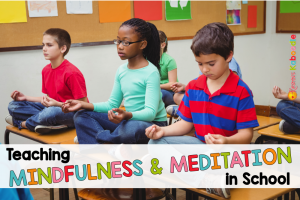 Meditation can help students learn how to focus, feel more peaceful, and connect with everything around and inside them. It also helps people learn how to respond to life’s challenges with more control, wisdom, and acceptance. Meditation is the formal practice of being mindful. Locate an exercise or activity that would work well with your students. Search on YouTube for “meditation music for kids” or “guided meditation for kids” (watch the video prior to playing it in your classroom, of course). Use a search engine on the internet. For example, “meditation script for kids” or “mindfulness exercises for kids” will garner a variety of resources. Download a FREE meditation and mindfulness product in my resource library. It contains a couple of quick exercises. When you subscribe to my site, you’ll receive the password for free access. An entire mindfulness and meditation product can be found here. It includes instructional pages as well as a number of exercises (some activities include guided scripts). Get your hands on other age-appropriate scripts or activities through Amazon or Teachers Pay Teachers. close their eyes and count their breaths for a specified amount of time. close their eyes and go to the most peaceful place they can imagine. spend time focusing solely on the sounds they hear in their environment. listen to you (or another student) as you guide them to breathe in and out with a certain number of counts on each inhale and exhale. imagine that peace and calm enters their body with every breath, while stress and anxiety are released on each exhale. scan their body and pay particular attention to any stress or tension in specific spots while intentionally releasing that tension. Remember that your mindfulness and meditation activity can be as short or as long as you’d like. Even if you only have ONE minute right after lunch, it is beneficial to use that one minute purposefully. Tell students to close their eyes, count their breaths, be mindful of the sounds in the environment, or take themselves to a relaxing destination. If one minute can make a difference, imagine what 10 minutes each day might do? 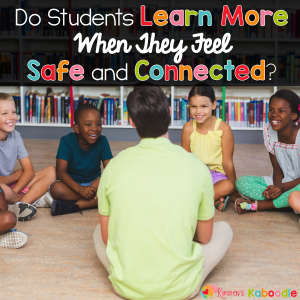 Using Positive Affirmations in the Classroom: Is it Worth Your Time? 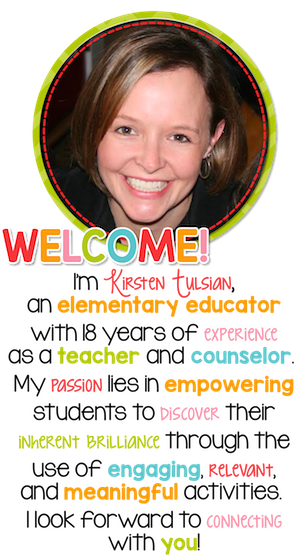 « Using Positive Affirmations in the Classroom: Is it Worth Your Time? Absolutely incredible post,I love the idea.Thank you for informative & really needed a post.